anti-bacterial properties of colloidal silver with the immune power of Transfer Factor XF®. Immune Spray easy to carry with you and use throughout the day. colors, flavors, sweeteners or preservatives. It is a great tasting orange-flavored throat spray. Take it with you on a plane! 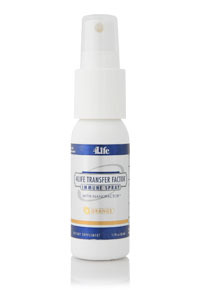 Transfer Factor XF (a proprietary blend of transfer factors and other natural components from cow colostrum), colloidal silver solution (14 ppm), natural mint or orange flavor, and vegetable glycerin.